As of this writing, the San Miguel Beermen just got the boot thanks to Rain or Shine, while the Meralco Bolts are going to try and stay alive against Alaska in Game 4 of their own semis series. Needless to say, the season’s second conference is reaching its home stretch, and the time is ripe for us to look back and show our appreciation for the players who really stepped up and made their mark. We’ll begin by looking at the best point guards of the league, which isn’t a very easy thing especially since this is an especially stacked position. 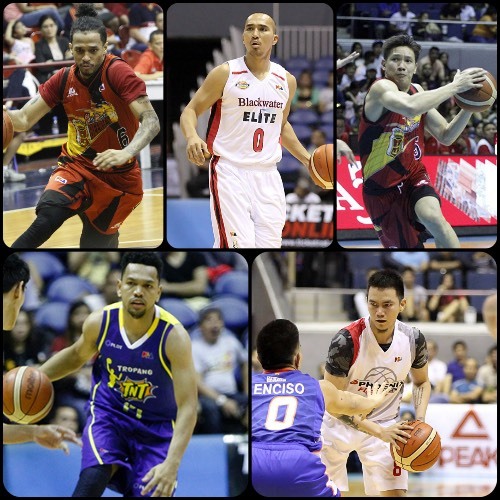 Tries and tested veterans like LA Tenorio, Jayson Castro, and Paul Lee are top of mind, but will all of them make this list? Let’s see. - Ross is a coach’s dream when it comes to classic point guards. He doesn’t score much (although he has the chops), but he doesn’t have to, given SMB’s depth at literally every position. What he does, however, is make sure the Beermen’s offense runs on at least a 95 octane rating, and he ensures that they are just as potent on the defensive end. This guy cleans the glass really well for a guard, assists better than anyone in the league, and also puts up the most steals per contest. And he’s not even the #1 PG on his club! - Whereas Ross takes care of making sure all other Beermen get their shots, Cabaggie is one of the team’s go-to shooters when the going gets tough in the clutch. With Ross around, Cabagnot doesn’t have to worry too much about being the conduit, and that makes him extra dangerous. If he gets even a sliver of an opening, he won’t hesitate to exploit that and take the big one. He’s as deadly as an assassin. - The Elite played respectable basketball for most of this conference mainly because Cortez rediscovered his potency as a playmaker. The Cool Cat is playing much better than he did last season for the Bolts, and that bodes well for the Elite, who are hoping to make a bigger splash in the next conference. If Cortez can continue to be effective both as a scorer and facilitator, good things may be in store for Blackwater. - The former UAAP MVP scored in double-figures in all but two of Phoenix’s games this conference, scoring 15 or more in all but one of those outings. He has really upped his game this conference, and it’s not surprise his name has been floated in possible transactions with other clubs looking for an upgrade at the PG spot. Garcia has top-level skill-set, of course, with great shooting and great playmaking. Quietly, he has proven to be the second-best PG in the Commish Cup. - Castro’s numbers this year aren’t as rosy as the ones he put up when they bagged the 2015 Commish Cup crown, but his production still puts him at the very top of the PBA’s point guar pyramid. He can still score at will, and he still lives up to the billing of “Best PG in Asia” on a good day. He’s been hampered a bit by injury, however, and maybe the long rest before the Govs’ Cup will serve him and his team well. When all is said and done, TNT still has the country’s best floor general in its employ.